The City of Atlanta and Emory University announced today that the annexation of Emory into the city has been approved by the City Council and will go into effect on Jan. 1, 2018. “We are thrilled that the City Council has approved our annexation petition,” says Emory University President Claire E. Sterk. 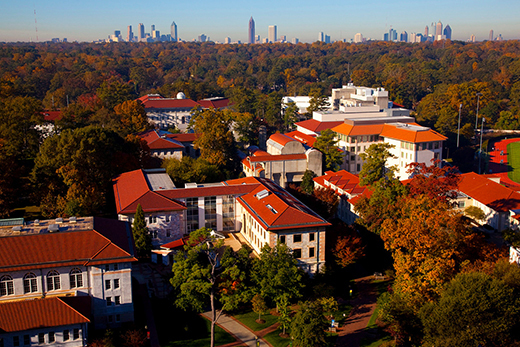 “Working together, Emory University and the City of Atlanta will continue building a stronger future for neighborhoods across the metropolitan area. We enter this new stage of our relationship with enthusiasm and great optimism for what lies ahead. Emory and the City of Atlanta have built alliances over many years. In addition to Emory University Hospital Midtown and Emory’s historical affiliations with Grady Hospital and the Morehouse School of Medicine, Georgia Tech and Georgia State, Emory’s stewardship of and investments in key business, arts, culture and scholarship resources drive economic activity to the region.